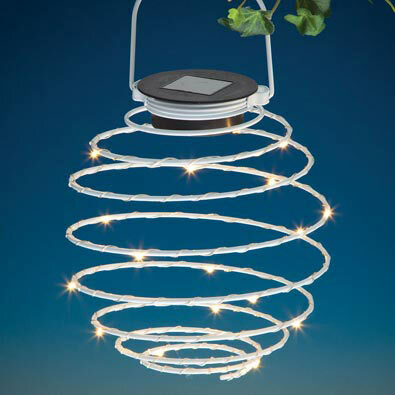 A flexible spiral lantern with 20 warm white LEDs that automatically turn on at dusk. The solar panel is charged by the sun during the day, giving a fantastic ambiance at night. Hang them around your patio, in your garden or on a hook anywhere for a unique accent. Contains 1 AAA NiMH rechargeable solar battery, included. Measures 9" long x 6" in diameter. Made of weather proof coated wire that folds flat for storage.